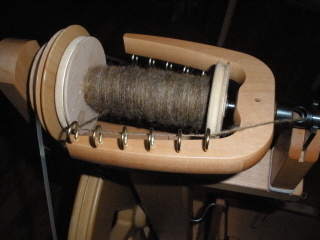 Grand total yardage with the fiber I had is 1,091 yards. Not enough for a sweater so I ordered more fiber. Since it's white, I won't have any color matching issues. 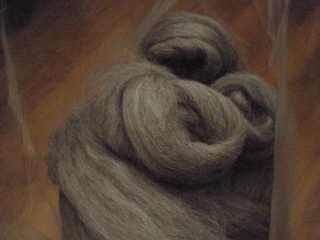 I also ordered some gray shetland. It even looks soft, doesn't it? Of course, I've already started spinning it. ...the romney from raw fleece. My preparation skills are improving with this fiber. 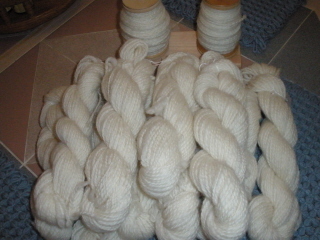 I have the romney, the "mystery" white fiber, alpaca and a "mystery" brown fleece that I got free from spin guild. I have some of it washed. It's a slow process. As I wash it, I store it in boxes in the garage so it's available when I'm ready to prepare and spin. I also have some alpaca that was sent to me by a ravelry acquaintance. It wasn't a lot so I've already washed all of it. It spins up nicely as well. So, I think I'm set for spinning fiber. Does that mean I won't entertain the notion of buying more? No, not at all! 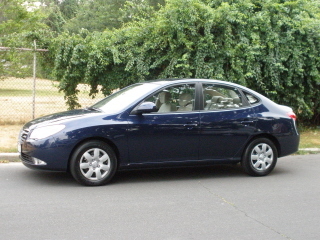 Kim got a new car! 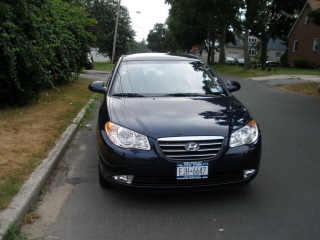 It's a Hyundai Elantra, regency blue. Pretty, right? 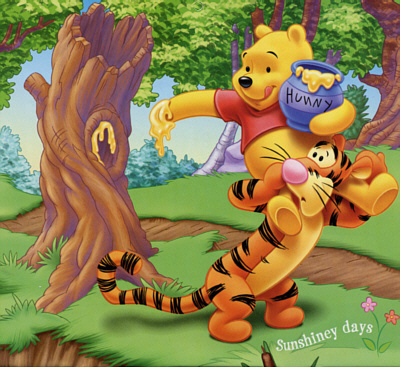 Kim and I are off to see Seussical The Musical at Smithtown this afternoon. Then, I'll be crafting for the rest of the day! Let's move backwards, shall we? I haven't been just sitting around eating bonbons, you know. 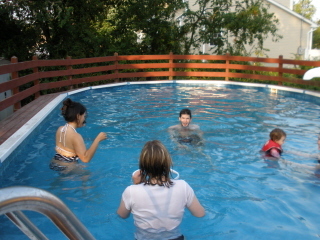 After not opening the pool last year (and possibly the year before that, I can't remember), we decided to jump in with both feet and get it going this year. Bill's just not in the mood. It's a lot of work but my incessant pleading finally hit pay dirt ("please, please, please, PLEASE!!). So, we've been out there sweating and working hard. If I don't lose weight from all this activity, then something is just not right. Anyway, yesterday, we reaped the benefits of all our hard work. Because of the heat and sun we've had the last few days, the water is so warm. 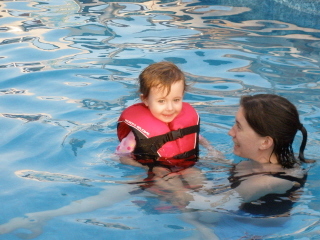 We had a bbq and introduced Lorelai to the pool. 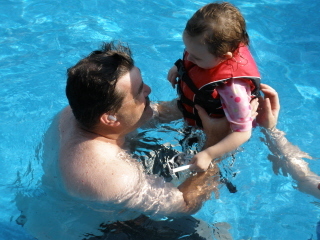 Grandpa bounced her up and down and the little daredevil said, "Again! Again!" 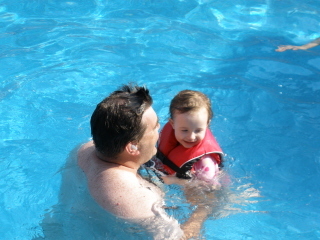 She's a little water rat. 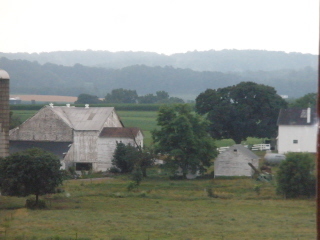 Early this month, we made our yearly Fourth of July week trip to Pennsylvania. This time, we stayed in the city of Lancaster. We stayed at the Hotel Brunswick. The room was really nice, although the hotel is in the midst of a huge renovation. It will be really beautiful when it's done. We were on the 9th (top) floor. 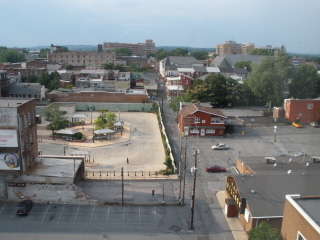 I was anticipating a nice view of beautiful downtown historic Lancaster. 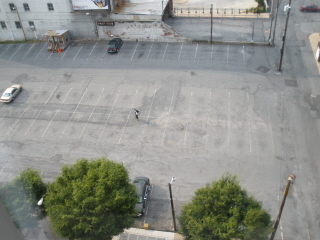 this parking lot was a bit rowdy at closing time...3 am? Ah well. Maybe next time, we'll skip the downtown area. 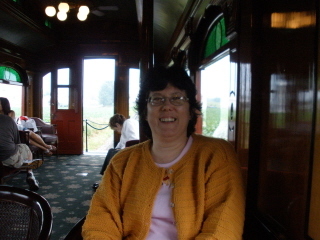 We went to Strasburg Rail Road. We took the kids there years ago. 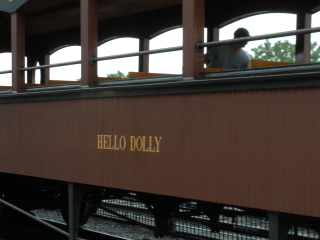 We saw the train from the movie, Hello Dolly. 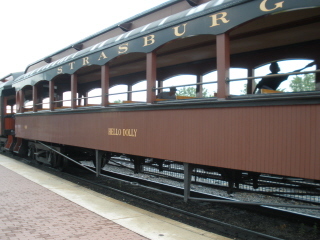 The main attraction at Strasburg is, of course, riding the train. 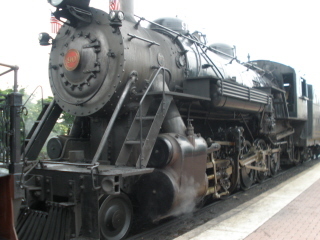 We watched the steam locomotive hook up to the train. Then we decided to live it up and ride first class. They have a waitress who serves drinks and snacks. Really fun! 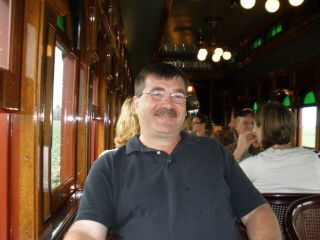 The ride is 45 minutes long and very relaxing riding through the farmland. The stealth project is coming along. 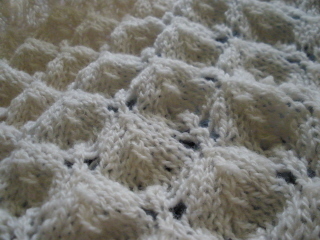 Although I will need help from my knitting group when I get done with the center square. Yes, I'll definitely need backup! I continue to enjoy the camaraderie of my knitting companions on Sunday afternoons. We knit and spin and attract attention! Yesterday, as I was spinning happily, one of the ladies laughed and told me that a young man standing on line at the counter (we meet at Panera bread), looked at me and did a double-take! Yesterday, we were also joined by Rosie, one of the spinners from my spin guild. She taught me to navajo ply. It will take a lot of practice. I felt like I was learning to spin all over again. 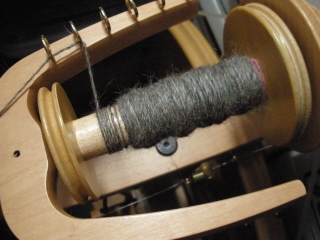 Speaking of spinning, look at this. That's 971.5 yards of wool yarn, spun by me. 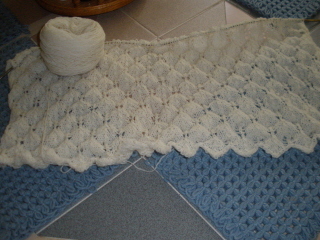 I'm hoping to get at least 1,200 yards, which will be enough for a sweater. That is all. Update complete. Wow, that's a load off my shoulders!